The events of Easter Sunday are the culmination of a long week for Jesus and his followers. The week began with Jesus riding into Jerusalem in triumph and ends with the empty tomb. It is known as Holy Week because of the world-changing significance of the events that happened that week. Why not take some time in Holy Week to walk with Jesus from the praises of the crowd on Palm Sunday to the darkness of the tomb? There will be a series of prayer stations in the Breukleman Room at Sunnyside Church to help you do this. The prayer room will be open everyday from Palm Sunday to Easter Day, 8am-late. 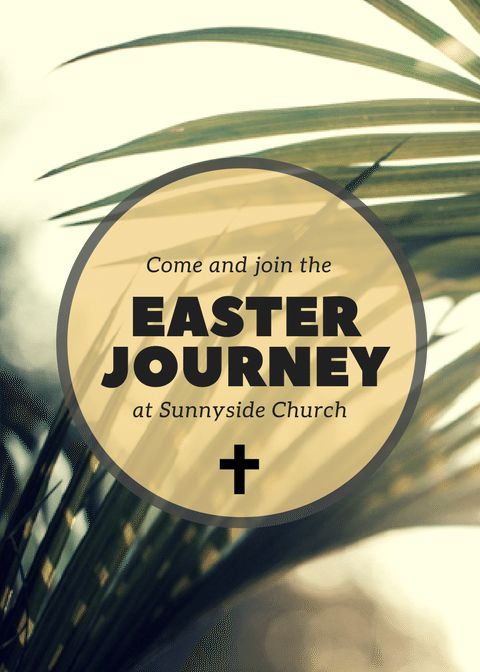 Do drop in and spend some time making the journey to Easter. I can promise that the joy of Easter Day will be even greater if you do! For further information, please speak with Rebecca.